East Stroudsburg University - This University's diverse undergraduate curriculum offers more than 60 major fields of study. In addition, exciting areas of concentration, professional certificate programs, and a vast selection of courses in general education will expand your intellectual horizons. And, at East Stroudsburg, you won't find yourself in a course taught by a "teaching assistant." Our experienced and knowledgeable faculty-people involved in scholarly research, writing, and artistic presentation-take their greatest pride in teaching. The faculty totals 254, with 181 holding the doctoral degree, while another 335 employees make up the management and non-instructional staff. Faculty members are representative of many and varied institutions of higher educations in both the United States and abroad. ASSOCIATE OF SCIENCE DEGREE - The Media Paraprofessional Program is a two-year technically oriented program of study. This sixty-semester credit hour program includes training in media-related skills, operating television and recording equipment, developing multi-media productions, and maintaining audiovisual equipment. Students may eventually transfer into the B.S. degree program in the Media Communication and Technology Department. BACHELOR OF ARTS DEGREE - The Bachelor of Arts degree emphasizes a liberal arts education which stresses cultivation of a breadth of learning in the sciences, social sciences, humanities and fine arts and is combined with strong competence in at least one field of the student's choosing. Because the program is flexible, students can obtain a basic preparation appropriate for graduate study or for professional studies in such areas such as dentistry, engineering, law, medicine, and theology. Graduates may also compete, through civil service examinations, for positions with the state or federal governments. Other graduates may seek employment in business firms or with industry. Whatever their career choices, students with liberal arts education will acquire far more that training for a job. The combination of General Education courses, a major in a discipline, a complementary minor or concentration if desired, a substantial number of free electives, and learning experiences outside the classroom through internships or travel will provide students with a sense of the historical and contemporary dynamics of our culture as well as the knowledge, skills, and understanding essential for the successful pursuit of one's personal, interpersonal, and professional life. Students major in an area of specialization in a single department or an interdepartmental program such as Fine Arts, Earth and Space Science, Environmental Studies or Interdisciplinary Studies. It is possible to complete requirements for more than one major within the four years of normal undergraduate study. In addition to major or double major, students may develop an interdisciplinary major appropriate to their interests and career objectives. No more than 48 of the 128 credits required for the Bachelor of Arts degree may be from a single discipline. Departments that offer courses in more than one discipline count these areas separately. Atypical student in a liberal arts program will choose 50 credits in fulfillment of General Education. Most departments require at least 30 credits for a major. A few departments, notably the sciences, have co requisite requirements in other disciplines. This still leaves as many as 30 credits of free electives. BACHELOR OF SCIENCE DEGREE - The Bachelor of Science degree offered by the School of Professional Studies, Faculty of Education, leads to teacher certification on the pre-school, elementary, and secondary school levels according to the program choice of the student. A comprehensive certification program in special education is also offered. 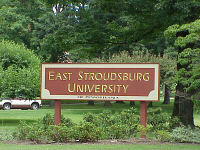 Programs in teacher education at East Stroudsburg University are approved by the State Department of Education. Graduates who receive the degree of Bachelor of Science will be recommended for certification to teach the subjects and grade levels in which they are qualified. Certification programs include early childhood, elementary, special education, and several secondary education areas. All applicants must be endorsed by the advisor, the chairperson of the department, and the Dean of the School of Professional Studies who is the Certifying Officer of the University. The Faculty of Hospitality and Leisure Service Management within the School of Professional Studies offers the Bachelor of Science degree in Recreation and Leisure Services Management and in Hotel, Restaurant and Tourism Management. The Bachelor of Science degree offered through the School of Health Sciences and Human Performance my lead to teacher certification, depending upon the program selected by the student. Teacher certification programs are offered in health, dental hygiene, health and physical education, safety education, school nursing, and school health education. The Bachelor of Science degree is also offered through this School in Allied Health Education, Nursing, Health Education, Speech Pathology and Audiology, and Physical Education. Concentrations are available in community health education, public health administration, athletic training and sport medicine, exercise physiology, movement, and sport studies and pedagogy. The Bachelor of Science degree is available through the School of Arts and Sciences (Faculty of Science) in special fields within Biology, Chemistry, Computer Science, Physics and Psychology, and through the School of Arts and Science (Faculty of Social Science) in the field of Management. Northampton Community College - Monroe County Branch Northampton Community College brings educational opportunities to a larger population of students by opening four off-campus centers. By offering courses in local communities where people live and work, students who would find it difficult to commute to classes at the end of a busy day find it convenient to attend courses offered in their own vicinity. The Northeastern corner of Pennsylvania is blessed with a number of nationally known quality institutions of higher education. The Lehigh Valley, located a short 35 minutes from Stroudsburg, is home to such fine institutions as Lehigh University, Moravian College, Lafayette College, Cedar Crest College and Allentown College of St. Francis de Sales. Located in the Wyoming valley about 30 /from Mt. Pocono are such prestigious institutions as the University of Scranton, Marywood College, Wilkes University and College Misericordia. Branch campuses of Pennsylvania State University are both located in the Scranton and Allentown areas, each a reasonable commute from anywhere in the Poconos. Monroe County VoTech - The Monroe County Area Vocational Technical School serves students from throughout the various districts with specialized training. Public and Private/Parochial Schools - The public and private/parochial schools throughout Monroe County enjoy strong reputations for academic quality. Private/parochial schools include East Stroudsburg Christian Academy, Evergreen Community School in Cresco, Faith Christian School in Roseto, The Growing Concern in Tannersville, Monsignor McHugh School in Cresco, and Notre Dame Elementary and High Schools in East Stroudsburg. Moravian Academy in the Lehigh Valley is another popular choice for those who prefer a private school educational setting. Additionally, pre school and after school programs abound throughout the Poconos to assist working parents.